Travis Head is looking forward to some red-ball cricket in the County Championship. TRAVIS HEAD has hailed his first hundred for Yorkshire as important in helping him to win the respect of the club’s senior players. Head smashed 175 on his one-day debut against Leicestershire on Sunday. It was the second-highest individual score in Yorkshire’s one-day history behind fellow South Australian Darren Lehmann’s 191 against Notts at Scarborough in 2001. As Yorkshire prepared to take on Notts today in a one-day match at Scarborough for the first time since that game in the One-Day Cup (11am start), Head said it was helpful to get a good score early in his stint as overseas player – not least to prove himself to his new team-mates. “It’s nice to get some runs first up and contribute,” said Head, who recently replaced New Zealand batsman Kane Williamson as Yorkshire’s overseas player for the rest of the season. “I haven’t played a lot of cricket – I’m only young – so to come here as an overseas player, there’s probably a lot of pressure, so it’s nice, with some senior players in the group, to get some respect there. “I’m here to try and impress, and I’m here to try and help win games. Head, a 22-year-old left-hander, was already guaranteed the respect of a dressing room that featured five current or recent England internationals at Leicester in the form of Liam Plunkett, Adil Rashid, David Willey, Adam Lyth and Tim Bresnan. Head himself has played one one-day international and two T20 internationals, and he looks a good bet to represent Australia at Test level in the not-too-distant future. As such, his comments contain a refreshing humility, along with a recognition of what it means to represent Yorkshire and to be part of a talented team. Yorkshire are chasing a hat-trick of County Championship titles and are on course to reach the knockout stages of both the One-Day Cup and the T20 Blast. “It’s been great so far, and I’m very proud to represent Yorkshire,” said Head, who has also hit 96 runs in three T20 matches for the county. “The boys have been fantastic and looking after me, so it’s been a lot of fun these last two weeks. “I knew they were strong and that they had a good culture, and they’re a great bunch. Head was recommended to Yorkshire by first-team coach Jason Gillespie, who first coached him last winter at the Australian Big Bash franchise Adelaide Strikers. The pair struck up a good rapport, and Gillespie was also on hand to present Head with his Australia cap when the player made his first international appearance in the T20 game against India at Adelaide in January. “Dizzy is fantastic,” said Head. “We’ve got a nice relationship, and he’s a great guy to have around the group, a nice, calming influence. “He gave me my Australia T20 cap, he got me in the Big Bash with the Strikers, and the freedom he gave me probably quickened that process up for me playing T20 cricket for Australia. Although Head is a key player for Yorkshire in one-day cricket, with his arrival significantly boosting their chances of landing a trophy, he is also an emerging four-day talent. Last winter, he led South Australia to their first Sheffield Shield final in 20 years, and there is much more to his game than six-hitting power. 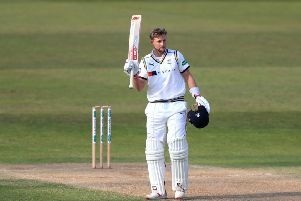 “I can’t wait for the four-dayers (the County Championship matches),” said Head, who has made 44 first-class appearances, scoring 2,607 runs at 33. “That’s the most exciting thing for me, I guess. “I’ve played a lot of white-ball cricket and whatnot, but I haven’t played a lot of four-day cricket lately. Before their Championship campaign resumes on Thursday week, when they entertain Warwickshire at Headingley, Yorkshire face a crunch few days in white-ball cricket. They lead the One-Day Cup North Group with three games left (after today’s match, Yorkshire take on Durham at Chester-le-Street on Sunday before playing Warwickshire at Headingley the following day), while a win at Northants on Friday would confirm their place in the last eight of the T20 Blast. “At the end of the day, we want to win trophies,” said Head. Yorkshire squad: (v Notts at Scarborough today, 11am, from) Bresnan, Carver, Coad, Head, Hodd, Leaning, Lees (capt), Lyth, Patterson, Plunkett, Rafiq, Rashid, Rhodes, Willey.